With spring officially here, many of us have begun cleaning and decluttering! 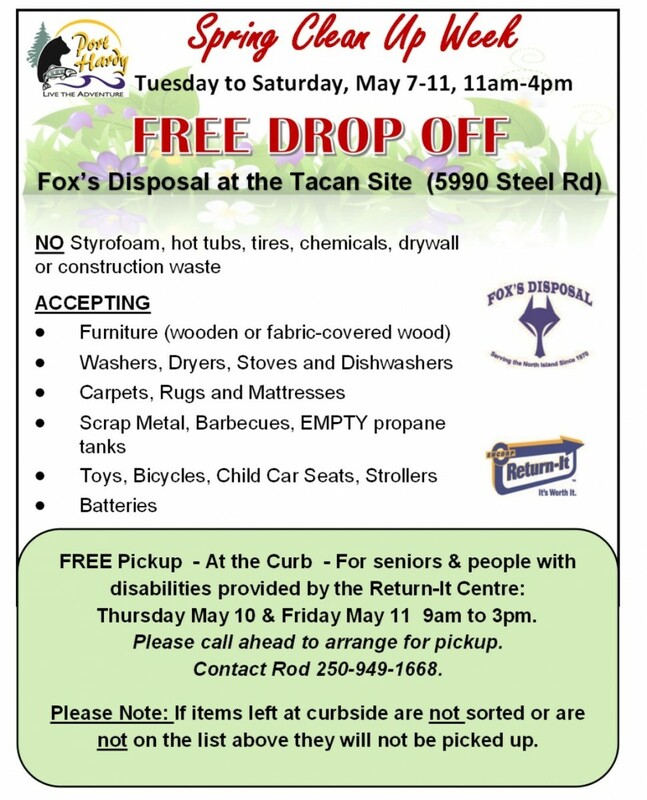 Port Hardy residents are welcome to use the FREE drop off Tuesday to Saturday, May 7-11, 11 AM to 4 PM at the the Fox’s Disposal Tacan site (5990 Steel Rd). Seniors and persons with disabilities are eligible for FREE pick up at the curb, provided by the Return-It Centre, Thursday May 10 and Friday May 11 ( Am to 3 PM. To arrange, please call Rod at (250)-949-1668. Please note not all materials are accepted and limits of ONE truckload per household!